This chic, classic bouquet showcases the very finest large headed red roses and pink roses beautifully. The roses and foliage compliment each other perfectly, and the elegant wrap and ribbon add a sophisticated finishing touch. 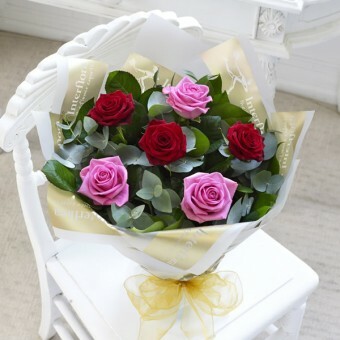 Featuring large headed red roses and large headed pink roses hand-tied with eucalyptus and salal and finished with gift wrap and ribbon.